image: Cairn L at Loughcrew, Knowth.com (link to image). We are rapidly approaching a significant point on the annual cycle -- one of the "cross-quarter days" which serve as "half-way markers" between the four great stations of the two solstices and the two equinoxes. In my most-recent appearance on the Grimerica Show for "Skies over Grimerica (January 2018)" we not only discussed the lunar eclipse of January 31, 2018, but also the concept of cross-quarter days. The solstices and equinoxes give us definitive markers for the annual cycle created by earth's orbit around the sun. The tilt of our planet's axis of rotation, relative to the plane of our orbit around the sun (the plane of the ecliptic), and the fact that the poles retain their orientation as we orbit (see this post describing the "earth-ship metaphor" for more on this phenomenon) means that the sun's rising and setting points along the eastern (rising) and western (setting) horizon will move further north during one half of the year (before reaching the northern limit at the June solstice) and further south during the other half of the year (before reaching the southern limit at the December solstice), passing through the half-way "crossing point" of the equinoxes midway between those solstice points twice per year (once on the way north to June solstice, and then again on the way south towards December solstice). These four points -- the June solstice, the midway crossing-point southwards at the September equinox, the December solstice, and the midway crossing-point northwards at the March equinox -- divide the annual cycle (which we call a "year") into four sections or "quarters." 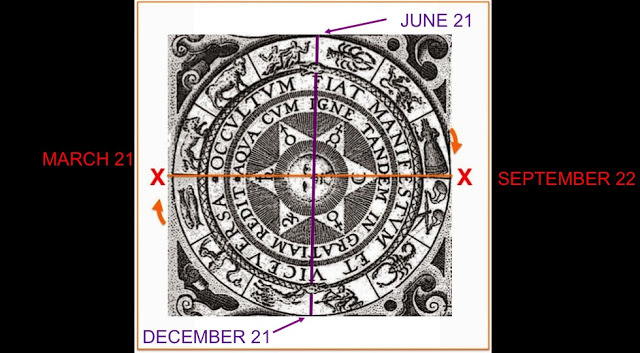 In addition to these four very important "quartering points," however, which divide the annual cycle into four quarters, we could also observe a point halfway between the solstice on either end and the two "crossing points" of the equinoxes in the middle. And in fact there is extremely solid evidence to suggest that ancient cultures did indeed observe such half-way points between the solstice and quinix observances every year. Because these half-way points further divide the already-quartered year (quartered by the four stations of the two solstices and the two equinoxes), they have come to be known as the "cross-quarter days." You can read more about cross-quarter days in previous posts from the very first year of this blog, such as this one and this one. Below is a diagram of the annual cycle using the zodiac wheel to indicate the positions of the quartering days of the two solstices and the two equinoxes, located at the junctures of the zodiac signs from the Age of Aries. Note that the dates given are the most frequently noted dates for the solstices (in June and December) and the equinoxes (in March and September), but that the actual calendar date for each will "drift around" a little bit, due to the imperfect match between the period of earth's rotation on its axis and that of earth's rotation around the sun. In other words, earth returns to the exact same point (such as the exact point of winter solstice) once a year, but because earth's rotation (which creates one day each time we complete a full rotation) does not fit evenly into that period of returning to the exact same point (one year), no calendar can have a perfectly even number of days (rotations) to get back to the exact same point on the orbit (the end of one year and the beginning of the next). This is why our calendars use "leap years," in order to bring the calendar date back to the traditional solstice and equinox dates shown above (otherwise the calendar would "drift apart" from the yearly progress markers of the two solstices and the two equinoxes). Various calendrical systems used throughout history have made use of other mechanisms besides leap years, such as intercalary days, to accomplish the same "correction" of the mismatch between daily axial rotations and annual orbital years. That said, we can use the most common dates of the solstices and equinoxes to determine the half-way points between these four stations of the year, and thus further sub-divide each "quarter" from the diagram above into two new "half-quarters" -- thus dividing the year into eight sections instead of four sections.These half-way points have traditionally been known as "cross-quarter days," because they draw yet another cross through the year, in addition to the cross formed by the equinoxes and the solstices. Instead of taking anyone's word for the dates on which these cross-quarter days should fall, we can very easily calculate those dates using any calendar. The easiest way to calculate the cross-quarter days is to simply count up the days between a solstice and an equinox, and then divide that number by two to find the number of days to count from either marker in order to each a date halfway between. As an example, let's use the calculation between the March equinox and the June solstice. The March equinox typically falls on March 21 (although the date will "drift" slightly due to the mismatch between daily axis rotations and annual orbits described above, and will thus need to be "re-set" back to March 21st using the mechanism of a leap year). The June solstice typically falls on June 21 (with the same note about drift which applies to the March equinox applying equally to the June solstice). From March 21 to June 21 we count 92 days (ten days from March 21 to March 31, plus thirty days from April 1 to April 30, plus thirty-one days for the month of May, bringing the count to seventy-one, plus another twenty-one days to reach June 21, for a total of ninety-two days). Dividing 92 in half, we get the number 46. When we add 46 days to March 21 (the March equinox), we will find the "cross-quarter day" that marks the half-way point between the March equinox and the June solstice -- which is May 6th. The same process could be done to find the halfway points between the June solstice and the September equinox (which falls on or around August 8), between the September equinox and the December solstice (which falls on or around November 8), and between the December solstice and the March equinox (which falls on or around February 4). Obviously, we are currently progressing between the December solstice and the March equinox -- and the cross-quarter day which we are approaching is the cross-quarter day falling on or around February 4. The cross-quarter days were understood to have great significance in ancient cultures which understood the tremendous importance of the heavenly cycles. They were celebrated as in western Europe and the British Isles as Beltane (the early May cross-quarter day), Lughnasad (the early August cross-quarter day), Samhain or Sawain (the early November cross-quarter day), and Imbolc (the early February cross-quarter day), as well as under other names both in Europe and around the globe. Upon the adoption of the Julian calendar (and the later Gregorian calendar, which modified the Julian calendar in order to improve the leap-year calculation used to correct the mismatch of daily rotations to annual orbits described above), many of the traditional holidays and observances associated with the cross-quarter days described above appear to have "migrated" to the first of the month in which that cross-quarter day would normally fall. For example, the cross-quarter day of Samhain or Sawain would fall on November 8, based on calculations following the pattern outlined above -- and yet we all know that the important holidays of Halloween and All-Hallow's Eve take place on November 1st rather than November 8th, with Halloween being celebrated on the Eve of November 1 itself. Similarly, the early May cross-quarter day which by strict mathematical calculation would fall on May 6th has migrated to May 1st and survives in numerous traditions associated with that date throughout the centuries, including both the dancing around the May-pole and other sundry May-day celebrations such as the association of May 1 with labor and worker's rights. The cross-quarter day marking the point half-way between the darkest day of winter in the northern hemisphere (the December solstice) and the day of "crossing upwards" into the upper half of the year (the March equinox) would normally fall on February 4, but it too has migrated towards the first of the month, and is most well-known for the observation of Groundhog Day. This cross-quarter day is also associated with St Brigid in Ireland, whose feast day is February 1. One tradition on the eve of St Brigid's day is to leave out a scarf or strip of cloth for Brigid to bless as she is passing by -- which is very interesting as the association of goddesses with scarves or sashes is found in mythology around the globe (see for instance the discussion in Star Myths of the World, Volume Two of the sash given to Odysseus by the goddess Leucotheia, and note that the traditional story of Sir Gawain and the Green Knight also features the gift of a sash of protection by a female figure to the knight Gawain, in a clear parallel to the Odysseus-Leucotheia story). We can be very confident that the observation of the importance of cross-quarter days is extremely ancient, based on the fact that some of the oldest surviving monuments on our planet contain alignments to sunrises on certain cross-quarter days. As discussed briefly in the "Skies over Grimerica" episode linked above, the passage mounds of the Boyne River Valley in Ireland are some of the most ancient aligned monuments to have survived from remote antiquity to the present day. The massive passage mound at Newgrange is very well known, and its sixty-foot long passage is known to align with the sunrise on the winter solstice, allowing a beam of light to penetrate all the way to the chamber deep within the great mound at that time of year alone. The mound of Newgrange and its aligned passage is thought to have been constructed around the year 3200 BC, over five thousand years ago and thus older than even Stonehenge. However, the passage mounds at nearby Loughcrew in the same part of Ireland, while not nearly as large as the mound at Newgrange, are thought by some scholars to predate the construction of Newgrange by an additional eight hundred years (thus dating Loughcrew to around 4000 BC). As discussed and diagramed by author, explorer, and archaeoastronomer Martin Brennan in his excellent book on the alignments and beautiful rock art of the Boyne River Valley passage mounds entitled The Stars and the Stones: Ancient Art and Astronomy in Ireland (1983), the passage and chamber of the mound known as "Cairn L" at Loughcrew (pictured above) is aligned to the sunrise on the cross-quarter days of February 4 and November 8 (the sun will pass through the same rising point on the eastern horizon on both February 4 and November 8, once on the way north in February between winter solstice and spring equinox, and then again on the way back south in November between fall equinox and winter solstice). 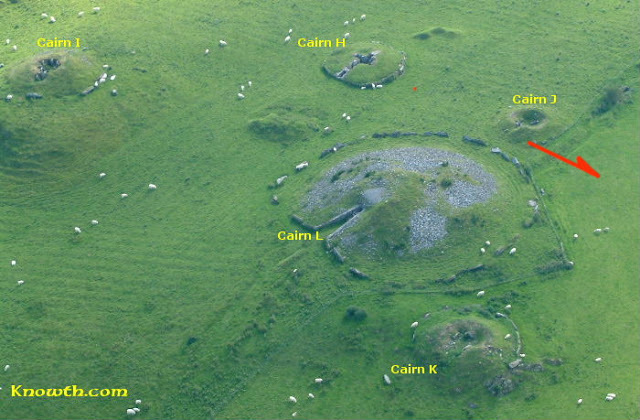 Those familiar with the earth's rotation will recognize that if the red arrow is pointing north, then the passage seen on the side of Cairn L is facing somewhat south of east -- and this is the direction from which a beam of light from the rising sun on the morning of February 4 will penetrate deep into the mound of Cairn L and illuminate a specially-positioned pillar within the stones of the passage mound. My estimate of the direction of the sunbeam from the rising sun of February 4 and November 8 is based on the diagrams and discussion found in The Stars and the Stones, pages 110 and 111.
image: Knowth.com (image link here). In the image above, the rising sun's beams would come in from the right as we face the image. The sun's rays will strike the standing stone visible on the left of the image (the stone with the green moss on its one of its faces) on the morning of spring equinox. Note the beautiful and distinctive spiral artwork on the stone in the background -- this stone is along the northern edge of the chamber at Cairn L.
Cairn L is thought to have been constructed some 6,000 or 6,100 years ago -- which means that the observance of cross-quarter days must be extremely ancient indeed. Just imagine the level of planning and design required to create an artificial mound containing a stone-lined passage in which a lone stone column or pillar is only illuminated on certain days, twice per year. This difficulty in planning and design (to say nothing of the effort required to actually execute that design) argues very strongly that the cross-quarter days which divide the year's four sections into a total of eight sections were held in very high esteem. And yet today, it is my impression that the entire concept of cross-quarter days is largely ignored or forgotten among the men and women of the modern world. I'm convinced based on abundant evidence that the many cycles of the sun, moon, planets, and stars were invested with spiritual significance as part of an ancient, world-wide system of code which informs the ancient myths, scriptures and sacred stories of virtually every culture on our planet. I am also convinced that these cycles (and the invisible, spiritual, or hyper-dimensional realms that they point towards) were understood to have actual impacts on the dimension we think of as the "material world" in which we normally operate. The more we begin to become aware of the ancient cycles and their significance, the more readily we can begin to grasp the profound wisdom which is patiently waiting to communicate to us through the precious ancient myths of humanity.